Mechanika provides expert-level stress analysis and multi-disciplinary analysis across the mechanical engineering sector. As a result of this, we have analysed, designed and delivered many types of equipment in a multitude of different and sometimes extreme environments. Because of the breadth of experience that we hold, we are able to benefit organisations who typically work within one sector, by supplementing them with our broad ranging knowledge and providing solutions that would not have been readily explored within their industry. Mechanika stays up-to-date with all of the latest technologies and manufacturing processes in all sectors, so that our clients can rest assured that we are up to date and will produce optimised designs with the latest technologies where appropriate. 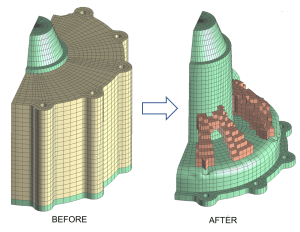 Mechanical Design Optimisation involves analysing a component, assembly or suite of products in order to quantify the mechanical/structural performance and compare it to the desired customer requirements. We then refine the design so that your products are able to consistently and exactly meet the defined performance criteria set out by you. We will also identify weight saving opportunities, assembly simplifications as well as the overall architectural redesign. Mechanika will help to keep you on the leading edge of the market place, by providing diverse and cutting edge knowledge of design, specialist FEA and calculation methods.